Ha....sounds like the divide between the "hill" country and the Delta in Ms!!!!!! Brudda now that was funny! And true! I respectively disagree and object about the fake gumbo from North Louisiana. In the 1990's when the Casino opened up in Marksville, La. They sponsored an open invitational gumbo cook off as part of their grand opening. I and 2 of my friends decided to go and participate in it. Well, we loaded up all of our supplies in an old Dodge work truck and headed that way early that morning. When we arrived we noted the commercial venders who were participating driving up in big high dollar motor homes all painted up with their company information and logos. There were companies from Baton Rouge, Lafayette, and New Orleans, From all over the South. They had their bright and shinny stainless steel cookers and utensils, while we pulled out our old smutty cast iron cookware from frying fish and cooking on the creek banks. I guess it is bayous in South Louisiana. I then started making a rue in a 3 gallon cast iron pot. It took me 3 hours of constantly stirring to make a nice dark rue that was not bitter. The team mates were busy boiling the chicken thieghs (chicken breast makes a gumbo stringy) and cutting up veggies. After deboning the chicken thieghs the bones were added back to the broth and continued to slow boil. After a couple hours the bones were removed and the broth was allowed to continue at a low boil to rended the broth to a deep rich chicken broth. I never add just plain water o gumbo. What a fun day. Owers and/or empliyees from Tony Chachers and Tabasco sauce family came by to visit and observe. Two of them turned out to be judges. Also was on KALB TV making the rue. Good day visiting with fellow competitors. It finally came down to the results. One of the team members had to be physicall assisted to be able to make it to the awards. Couldn't keep up with cajun hospitality. LOL. We did make it to the awards room. When the awards were announced, we had placed FIRST in best gumbo which paid $1,000 in silver dollars. Believe it or not we had also placed FIRST in product showmanship and was awarded $500.00 in silver dollars. So this gave us $500.00 each in awards. So what then. We went to one of the restaurants and had a real fine prime rib. Upon leaving the restaurant we went straight to the truck and headed home. We new what would happen if we went to the casino floor-- we would leave pennyless or wind up in jail. LOL Too much cajun hospitaliy!!!! Was this a fluke-- NO NO-- we went back the next year and placed third. Thanks for considering my objection. Ben...y'all were the Kings that day!! That is quite a feat considering the competition. Wish I had some of that gumbo for supper! I'm glad Ya'll won Ben!! To be fair you served Yankee Gumbo to Yankees so it's not a surprise Ya'll won. That's were the I-10 rule comes into play. I'm joking, I've eaten terrible gumbo all over La but always eat good at home. Rabbitproof-- Thank you for the nice comment. Rajun Gardener-- Rob thank you for your nice comment also. I basically agree with the statement. As I see it (which doesn't mean much) is that Cajun food name sells and many restaurants just decide to put Cajun food on the menu with out any idea on how to cook it. It's these people who have ruined the reputation of the real Cajun food. I do not order gumbo from restaurants except for a small bowl as an appetizer just to taste. Even here in Natchitoches there are restaurants that have gumbo that is not worth a crap. Just one friendly rebuttal on "serving Yankee gumbo to Yankees"--Keep in mind that 2 of the judges were from Tony's and Tabasco. You can not get much more Cajun than those two, and can not get much further south than Avery Island. A belated Ben on your win! With a lot of help from Zook I made my first Gumbo in February. He sent me a jar of Savoies Roux ( a real time saver) some okra and Tony's seasoning. I used bone-in Chicken thighs. 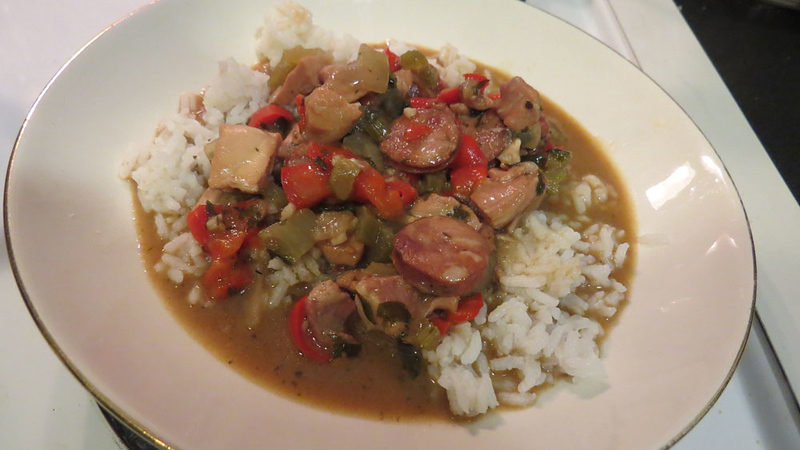 Andouille sausage and doubled the amount of celery, onions, and peppers and served it over rice. We do not have Tasso in our stores but we enjoyed it. I'm just ragging on you Ben to keep your heart rate up, think of it as free exercise!! Maggie, That Yankee gumbo looks good!!! Rajun Gardener-- I realize that, the whole thread has all been in fun. Maggie-- Thanks for the congrats. Looks like you did a real good job on your first gumbo. That Savoies rue Is definitely the best of the commercial choices. You had good teacher. It sure looks like it's suppose to Ms. Maggie. I bet it was real good too! Ben, I thought of you when I saw this. And a thank you to Zook for helping me create it. Rob--Hey, Thanks. The last time I passed through Marksville was when I attended the fall get together at Donald's house the last year he had it at his house. P.S. Your garden looks good.